April Class III and Component Milk Prices were announced on April 30. They were almost identical to the prior month. Cheese inventories remained high and cheese prices remained low. Cow numbers remain high and the USDA cow headcount forecast gets larger with every forecast. Class III prices were $12.92/cwt vs. $12.78 last month. The average since the current pricing system was introduced in January, 2000 is $13.26/cwt, so while April was a least slightly higher than March, dairy pricing is still 3 percent below that long term average. The chart below displays the long term trends in component pricing. Protein has been well above butterfat for most of the decade. Cheese inventories must come in line before rational pricing can return. The Daily Dairy Report today opened with the statement "Cheese production reached record levels in March". For the near future, protein will probably remain depressed. April milk check component pricing (chart below) was split almost identically to the prior month. The milk check remains dependent on good component production and more milk protein is still the most important way to increase the milk check. 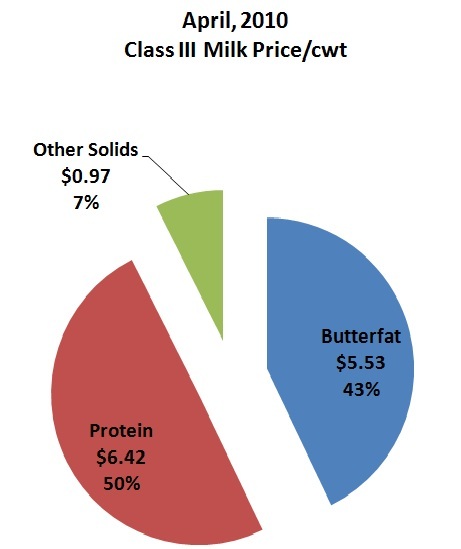 At the low protein prices and the high butterfat prices, protein is still worth 36 percent more per pound than butterfat. What is the best strategy for a producer? Work on components and especially on protein. 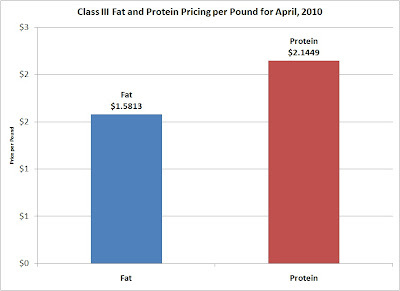 Protein is key to income and in tough dairy times, maximizing income is critical for survival.